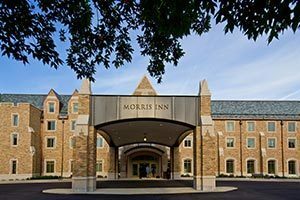 The Morris Inn at the University of Notre Dame has been selected for membership in the Historic Hotels of America program of the National Trust for Historic Preservation. The AAA Four Diamond Morris Inn is one of just 295 hotels and resorts throughout the country that have been recognized by Historic Hotels of America for preserving and maintaining its historic integrity, architecture and ambiance. The new designation comes as the inn joins celebrating Notre Dame’s 175th anniversary. To be selected for membership in Historic Hotels of America, a hotel must be at least 50 years old, have been designated by the U.S. Secretary of the Interior as a National Historic Landmark or listed in or eligible for listing in the National Register of Historic Places and be recognized as having historic significance. The gift to build the Morris Inn was donated by Notre Dame student Ernest M. Morris. In 1902, Morris could not pay his tuition, so he asked the school president for two favors: to let him continue enrollment on credit, and to take care of his horse Dexter. The university agreed and Morris went on to graduate, eventually founding his own investment firm. He donated $1 million to aid the University in its post-war expansion, and Morris Inn was constructed in his honor. In 2012, Ernestine Morris Carmichael Raclin, daughter of Ernest and Ella Morris, along with her family and the Carmichael Foundation, provided a gift to the University for the purpose of funding a major renovation and expansion of the Morris Inn. On Oct. 21, 2012, the inn was closed for the first time in 60 years and the project began. Following a more than $30 million renovation, it reopened in late August 2013 and now offers 132 guest rooms and 18 suites. The Morris Inn’s AAA Four Diamond rating places it in the top 5 percent of hotels in the United States. Located near the center of the Notre Dame campus, the Morris Inn includes the fine-dining restaurant Sorin’s and the Rohr’s tavern. Guests can tour the campus and take in its many landmarks, including the Golden Dome of the Main Building, the Basilica of the Sacred Heart, the Grotto of Our Lady of Lourdes and the “Word of Life” mosaic (“Touchdown Jesus”). Sports enthusiasts can take a tour of Notre Dame Stadium and play a round of golf at Ben Crenshaw/Bill Coore-designed Warren Golf Course, the site for the 2019 U.S. Senior Open. Historic Hotels of America is the official program of the National Trust for Historic Preservation for recognizing and celebrating the finest historic hotels. Historic Hotels of America was founded in 1989 by the National Trust for Historic Preservation with 32 charter members. Today, Historic Hotels of America has more than 295 historic hotels. These historic hotels have all faithfully maintained their authenticity, sense of place and architectural integrity in the United States of America, including 46 states, the District of Columbia, the U.S. Virgin Islands and Puerto Rico. Historic Hotels of America is comprised of mostly independently owned and operated properties. More than 30 of the world’s finest hospitality brands, chains and collections are represented in Historic Hotels of America. For more information, visit HistoricHotels.org. Originally published by Molly Schau at news.nd.edu on February 15, 2017.